Small - €190.99 Only 6 left! Medium - €190.99 Only 1 left! The life of the lovely Countess Elizabeth Báthory de Ecsed is known well in some circles. In others, the notorious Bloody Lady of Csejte sounds like a character from a horror novel. The Countess of the Carpathian Mountains holds the title of the most infamous female murderess, holding victims in excess of 600 people! Though, her vampiric practices of bathing in blood in order to forever preserve her beauty might not have certain truth, she is yet called the Blood Countess and managed to escape trial. Living in silent and solitary confinement until her eventual death, even her self-imposed prison became eternal when it was walled up. According to legend, anyway. But, what comes of a woman who will likely forever hold the record for such single acts!? What happens to the woman who may have ensured her eternal youth through the sacrifice of virgin blood? When the locals barked angry thoughts at the idea of the Bloody Countess being buried among those that she’d slain, she was to be sent elsewhere, buried perhaps in the family crypt. Though, none know where she is this day. Except, of course, those who know of the ghostly balls that take place in the afterlife! The gala is set to occur again and what celebration could be complete without an appearance of the illustrious and eternally beautiful Corpse Countess? You may have moved onto the afterlife, but you still hold the crown of the loveliest at the ball. Your lovely gown is accented with lace and brocade, tattered by time as it might be. 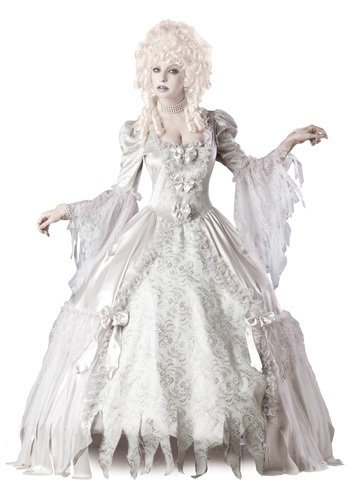 Silver bows and nylon lace makes this structured petticoat and gown the eminent sight both in life and afterlife. Bolster your look with additional ghostly white makeup and a hauntingly lovely period wig and it will be as though Bathori walks once more!